Diet culture gives carbs a bad rap. It’s true that going low-carb is effective for losing weight, but carbs are ultimately the fuel our bodies need to recover from workouts and keep our energy up throughout the day. Complex carbs like sweet potato, quinoa, lentils, and whole grains are considered “good” because they are rich in gut-friendly fiber, and they break down slower, leaving you fuller for longer. In comparison, simple carbs such as white flours, sugars, and white rice have less nutritional value and metabolize at a quicker rate. But what about oatmeal, a breakfast staple? 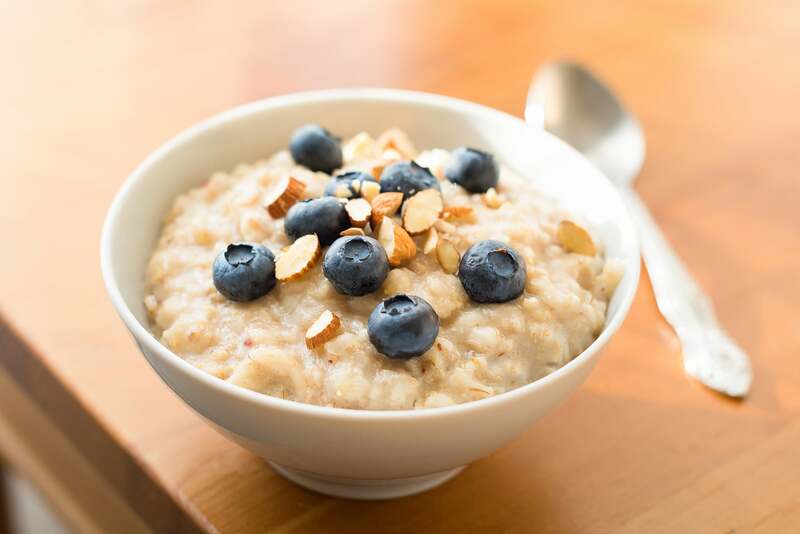 While Chelsey, owner of Chelsey Amer Nutrition and author of Thrive in 5, said there is “no one definition of a low-carb diet,” she named oatmeal as a good choice for a “balanced eating plan” because of the fiber levels. Per half-cup serving, it contains 27 grams of carbs and four grams of fiber, she said. 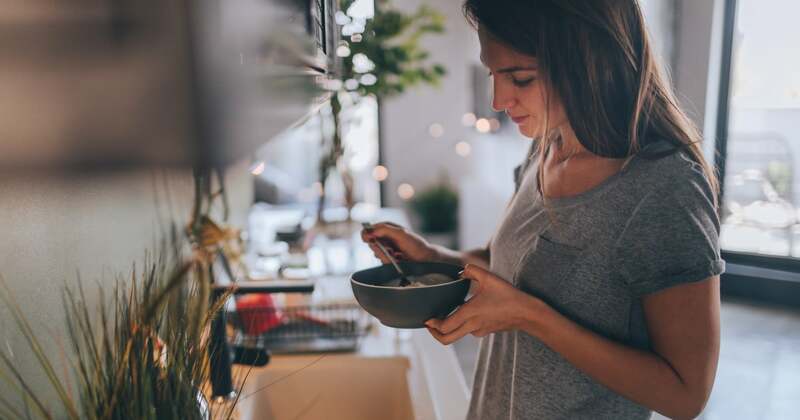 This makes up about about 13 percent of the recommended daily value of fiber, she added, which is 25 grams for women under 50 and 35 to 38 for men under 50. In general, oatmeal is extremely satisfying, and this helps prevent overeating, Chelsey explained. This could benefit people who are following a low-carb diet since you can still overeat complex carbs if you’re not careful. She suggests pairing oatmeal with a high-protein food such as yogurt, cottage cheese, or eggs because “by consuming fiber-filled carbohydrates, like oatmeal, with protein and healthy fats, you’ll balance your blood sugar better and stay full for longer.” You can also try mixing oatmeal with Greek yogurt specifically or making an “oatmeal bake” the night before a busy morning (she gave this recipe as an example with rolled oats, plain Greek yogurt, and banana slices, and it looks delicious). Lastly, Chelsey said to avoid prepared oatmeal that contains added sugar. For natural sweetness, use fresh fruit instead. POPSUGAR has spoken to a lot of experts in the past who’ve laid out guidelines for how many carbs to eat per day. It depends on your goals, and you should talk to your doctor about the best numbers for you, but the average person’s caloric intake should be made up of 45 to 65 percent carbs, according to the Institute of Medicine (IOM). Lori Zanini, RD, CDE, said in a previous interview that staying within the lower end of that percentage is ideal if you’re looking to lose weight. She advised, though, that you shouldn’t dip below 130 grams of carbs per day, which is the Recommended Dietary Allowance (RDA) of carbs declared by the IOM. Leslie Langevin, MS, RD, CD, of Whole Health Nutrition, recommended that your diet consist of 25 percent carbs when your goal is weight loss. To figure this out, she provided the following equation: multiply your caloric goal by 0.25, then divide that by four (since one carb contains four calories). For example, if you’re trying to eat 1,500 calories a day, the equation would looks like this: 1,500 x 0.25 = 375; 375/4 = 93.75 grams of carbs. If you’re trying to gain muscle, Jim White, RDN, ACSM, owner of Jim White Fitness and Nutrition Studios, suggested a high-carb diet with a macro breakdown of 55 percent carbs, 25 percent protein, and 20 percent fat. (If you’re trying to lose fat and gain muscle, see this expert’s advice on what your diet should look like.) Remember, carbs don’t have to be your foes; they can be your friends, even when you’re cutting them down for weight-loss purposes. If you need ideas, check out this list of dietitian-approved foods, and this roundup of low-carb recipes.